Two five-month old babies who were swapped in a Peruvian hospital will be reunited with their biological parents, officials say. The mistake came to light when one set of parents ran DNA tests to check whether the baby's father was the woman's husband or a previous partner. They found that none of the three was related to the newborn. 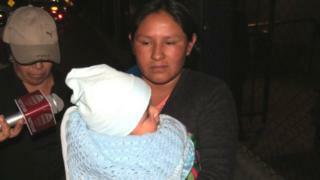 After further tests, they found their biological child living with another couple in the same city of Arequipa. Following the initial DNA results, Maribel Musaja and her husband Marcos suspected their biological baby had been swapped with Mateo, the boy they were carrying, at the hospital. On the same day, 25 April, 11 other babies were born at the hospital. Six of the women agreed to undergo DNA tests, worried that their babies could have also been swapped. Among them was Yovana Vera, who was carrying Liam. Tests showed that Mateo was her biological son, and had been swapped with Liam. Reports say both women wanted to keep the swapped babies on hearing the news. "I'm not ready to give [Mateo] back, but I have to do it, I have to be strong," Maribel Musaja told Peruvian newspaper La Republica (in Spanish). "Both things hurt me: having to be far from my son and being away from Liam." The boys remain with their current families but the mothers have agreed to swap them back, officials said. The families will now receive psychological assistance and no timetable for the full return has been given. A local medical official said the swap was a result of "human error". An investigation to determine who was responsible and how it happened continues.